If you’re like many recording musicians, your studio relies on software effects and a few hardware devices. You need a versatile recording interface with great sound and enough analog inputs and outputs to mic a large drum kit or a small band. .The FireStudio Project's rear panel sports eight General Purpose outputs and a pair of left/right Main outputs. all on balanced, ¼-inch TRS jacks. The audio source for the Main outputs is the same as that of General Purpose outputs 1 and 2 (DAW Playback 1 and 2, by default). The difference is that the output level of the Main outputs is controlled by the FireStudio Project's front-panel Main volume knob. 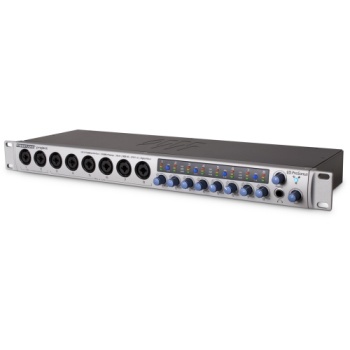 Need digital I/O? No problem: FireStudio Project includes stereo S/PDIF.